FIRST SHIP/PICK-UP PEONIES LAST DAY TO ORDER FOR 2017 IS AUGUST 18TH! My, my where has the summer of 2017 gone with all the peonies! Some of you have been calling and emailing regarding the last day to order for our first shipment/pick-up and it is coming very, very quickly. This Friday, August 18, 2017 will be the last day for ordering first ship/pick-up peonies. That date is especially notable for gardeners in USDA Growing Zones 2-5. We do one shipment/pick-up in mid-September and one shipment only in early-mid October for USDA Growing Zones 6-8a. Having our bare-root peonies arrive at your optimal planting time is key to growing peonies…the right way…as bare-roots! 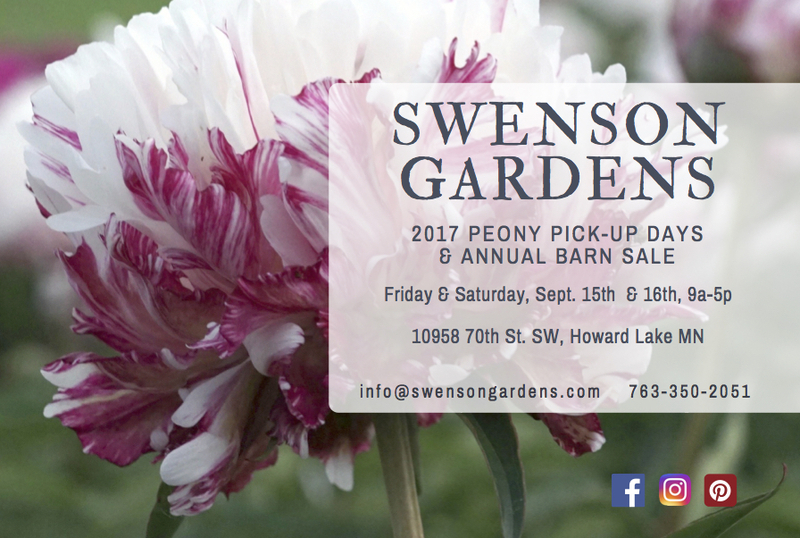 For the peony gardeners in USDA Growing Zones 6-8a, your last day to order is Friday, September 22, 2017. Make sure if you are doing mail-order that your order forms arrive on those dates. Any orders for USDA Growing Zones 2-5 that come in after August 18, 2017 will only be shipped out in early-mid October. We may be the only peony grower that digs/divides/processes our peonies within 24-hours that then go directly into our coolers for mild temperature storage until they are packed for delivery. Thousands of peony roots go through this process that may take upwards of 2-weeks to complete. We want to make sure that the peonies you order from Swenson Gardens are the largest and freshest bare-root peonies to insure your generational enjoyment for years to come!